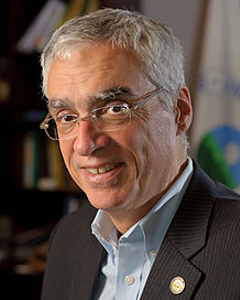 Bob Perciasepe is President of the Center for Climate and Energy Solutions, which is widely recognized in the United States and internationally as a leading, independent voice for practical policy and action to address the twin challenges of energy and climate change. Mr. Perciasepe has been an environmental policy leader in and outside government for more than 30 years, most recently as Deputy Administrator of the U.S. Environmental Protection Agency (EPA). He is a respected expert on environmental stewardship, natural resource management, and public policy, and has built a reputation for bringing stakeholders together to solve issues. While Mr. Perciasepe served as Deputy Administrator from 2009 to 2014, EPA set stricter auto emissions and mileage standards, increased protections for the nation’s streams and rivers, and developed carbon emissions standards for power plants. Mr. Perciasepe was previously assistant administrator for both the agency’s water and clean air programs, leading efforts improve the safety of America’s drinking water and lower sulfur levels in gasoline to reduce smog. In 2002, Mr. Perciasepe joined the National Audubon Society, one of the nation’s oldest conservation organizations, as its senior vice president for public policy. He served as the group’s chief operating officer from 2004 to 2009, and worked to protect wetlands and expand environmental education. He has also held top positions in state and municipal government -- as Secretary of the Environment for the state of Maryland from 1990 to 1993 and as a senior planning official for the city of Baltimore, where he managed the city’s capital budget. Mr. Perciasepe is a member of the Bank of America National Community Advisory Council, the National Academy of Science Board on Environmental Studies and Toxicology, the National Petroleum Council, and the North American Climate Smart Agriculture Alliance Steering Committee. He is also a member of the Center for Climate Preparedness and Community Resilience Advisory Board at Antioch University and received American University's William K. Reilly Award for Environmental Leadership. Mr. Perciasepe holds a master's degree in planning and public administration from the Maxwell School of Syracuse University and a Bachelor of Science degree in natural resources from Cornell University.